National Cherry Pie Day is celebrated annually on February 20. Today is a great day for all cherry pie lovers to enjoy their favorite pie all day long. Although February is not a season for cherries, you can always buy frozen pie cherries for cooking in a grocery store. The best choice for pies are tart and a little sour cherries, e. g. Morello, Bing, Montmorency. These cherries hold up well during baking process and give your pie a great flavor. It is believed that pies appeared in the USA with the first English settlers. They cooked their pies in a long and narrow pans. The crust of pies often was not eaten and served only to hold the filling during baking. The first cherry pie, as legend says, was invented by Queen Elizabeth. This pie was her favorite, by the way, as well as George Washington's too. Is there any reference between Washington and cherry tree? That is right, may be it's the reason why National Cherry Pie Day is celebrated in the same month as Washington's Birthday. 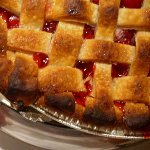 Many people think that apple pie is everyone's pick, but sweet cherry pie deserves a place next to it. This dessert is one of the greatest American dishes, that is why we celebrate this day with a homemade cherry pie.